The modular single cleaning station is designed for industrial use and is available in five sizes (300, 550, 800, 1200 and 1600 litres). 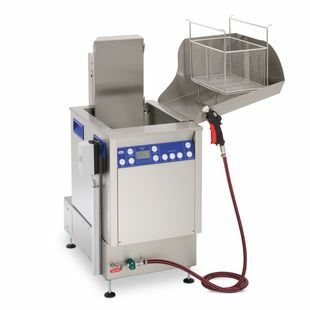 Equipped with two design variants: Multi-frequency 25/45 kHz (MF2) or 35/130 kHz (MF3) and an oscillation device for the cleaning basket that supports the cleaning effect of the ultrasound and provides a drain positionfor the stainless steel basket; the Elmasonic X-tra pro modules are ideal for various cleaning tasks. bottom run-off of cleaned sediments (optional) complete the range.